Since 2016, the Magic Mirror® has attended over 800 weddings and events all over Ireland. Photos make the best memories! With Magic Mirror® you can capture all the greatest moments from your special occasion. 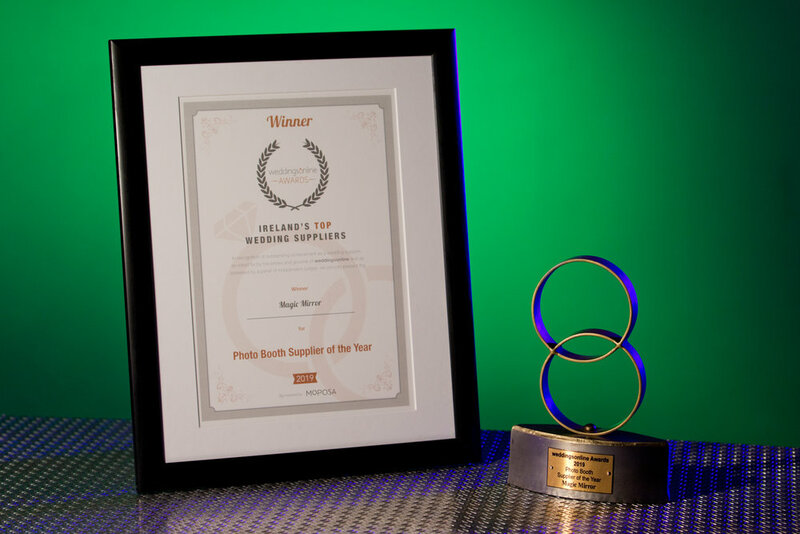 In 2019, we were delighted to win Weddings Online, Photo Booth Supplier of the Year 2019 award. So you know you are getting the best service. This stand-alone, full-length mirror has the option of interchangeable and customisable frames that will complement any party theme. The Magic Mirror® captures unique and fun moments with help from our fab staff. Photos are instantly customisable by adding a signature to the photos simply by using your finger and signing on the mirror. Once done, the photo is printed within a few seconds and ready to take away. The Magic Mirror® is a fantastic addition to your wedding, debs, party or corporate event. Contact US to book in. will take your special occasion to the next level.